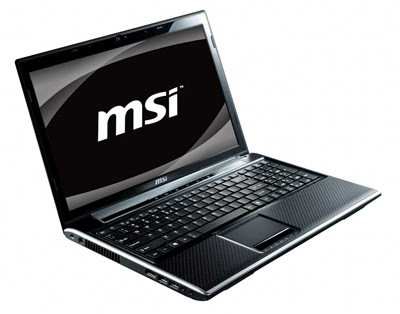 MSI has unveiled its all-new 15.6-inch F Series FX610MX laptop, featuring AMD's new generation Phenom II triple-core processor and the ATI Mobility Radeon HD5470 discrete graphics card (512MB DDR3 VRAM). It comes with MSI’s exclusive GPU Boost and ECO technologies which switch display and power management modes to meet your current needs, allowing you to strike the ideal balance between powerful multimedia performance and battery life. MSI Marketing Director Sam Chern explains that the FX610MX employs a cinema-class 16:9 ratio power-saving LED display, ideal for viewing films, as well as MSI’s Cinema Pro multimedia technology to enhance display color and clarity. What's more, the exterior of the FX610MX is sheathed in MSI's own raised totem seal coating to give it an extra touch of class and protect it against scratching, wear, and smudging. It also comes with a seamless, multipoint touchpad. You won't want to go anywhere without it. AMD Phenom II X3 processor: The FX610MX comes equipped with the newest generation AMD Vision Ultimate platform—the Phenom II triple-core processor, which not only processes data faster than duo cores, but does so using less power. Processing large quantities of data was never so easy. ATI Mobility Radeon HD 5470 discrete graphics card: The FX610MX also packs the latest ATI Mobility Radeon HD 5470 discrete graphics card with 512MB DDR3 of display memory for better display performance, clearer images, and more brilliant colors to give you the best possible visual experience available. Cinema Pro: The FX610MX not only comes with a high-end processor and discrete graphics card, it boasts MSI's own Cinema Pro technology. Before watching a film, simply depress the Cinema Pro hot key and the FX610MX will switch over to film mode for crisper, clearer images with richer colors. You’ll find yourself riveted to the screen as you watch your favorite films. 16:9 cinema class, power-saving LED screen: In addition to the high-end processor and discrete graphics card, the FX610MX also features a 15.6-inch, 16:9 LED which offers richer, brighter colors and crisper resolution to maximize your multimedia experience wherever your are. GPU Boost: MSI's GPU Boost technology allows the FX610MX to switch between the discrete graphics card and the graphics modes. So when you're processing heavy-load graphics applications, one touch of the hot key switches you over to the discrete graphics card mode for more powerful graphics processing. For word processing and browsing the Internet, you can cut over to the power-sipping integrated graphics chip mode. ECO Engine: The FX610MX also features MSI’s exclusive ECO engine power saving technology which allows you to select from among five power management levels—Video Game, Film, Presentation, Word Processing, and Turbo Battery, to automatically adjust display brightness, on/off switch, sleep mode, and processor performance settings, maximizing battery flexibility and use per charge. Style and technology in one package: MSI employed exquisite craftsmanship and the latest technologies to give the FX610MX a uniquely elegant design as it continues to "Insist on the Best." The cover is protected by an anti-scratch, anti-wear, anti-smudge, no-peel jet black raised totem seal coating. What’s more, the center is graced with a shimmering MSI logo and the wrist placement areas with a raised diamond texture to enhance comfort of use. The zenith of precision technology: Every detail of the FX610MX's body was meticulously crafted by MSI's design team. The power button is encircled by chrome plating which blends wonderfully with the cold, luminescent blue lights above the keyboard. The unmatched chiclet keyboard with its solid touch, the raised multipoint touchpad, and the brush finish of the hotkey zone add further class to the FX610MX. 802.11n high speed wireless and HD720p webcam: The FX610MX comes equipped with an HD720p webcam 802.11 b/g/n high speed wireless, Bluetooth V2.1+EDR module with X3 transfer rate, and a high-performance instant messaging device that allows you to stay in touch with friends and family anywhere in the world. HDMI: The FX610MX features High-Definition Multimedia Interface (HDMI) which transfers up to 5Gb of video bandwidth for clear, true-to-life image quality to show HD images on large-screen televisions. Now, sharing exciting high-quality multimedia on large-screen devices, like projectors and digital TVs is easier than ever. eSATA high speed transfer interface: MSI's FX610MX combines eSATA and USB interfaces into one port, so you can select between USB or eSATA when connecting up with equipment. The eSATA interface, for instance, transfers data at speeds 6.4 times faster than the USB2.0, so using the eSATA interface to connect to an external hard drive gives you read rates almost as fast as those of an internal hard drive.